November 28 will mark the two year anniversary of my dissection experience. I am really glad it happened then and I am somewhat 'fixed', at least for a while. But aren't we all here only a 'while'? So every day I wake and am breathing is a blessing beyond any words I could write. Each new morning's light is like a coffee break (I'll take espresso) in the long day of uncertainty. However at the end of the day, as the sun sets, a sometimes subliminal fear sets in, a fear of not waking up. I think this dread of the dark is a weaving of many thought currents not the least being the memory of my late night dissection and the severe panic and pain accompanying the aorta tear. So at night I do not welcome that visitor of disquietude. Yet it predictably comes. I do not understand many things. But I know this; it is good to wake up and take a breath. For every new sunrise I am granted absolution from a darkness once more. Maybe for me this reprieve is what grace is all about. One of my physical therapies for preventing the descending dissection in my body from further aneurysing is to take daily walks. The Atlantic Ocean is one of my favorite spots for many reasons. Walking along the Atlantic, the crashing waves calm my spirit and quiet any rising hypertension. There is always plenty of wildlife and nature to take in, either with the camera or just sitting still and appreciating the amazing life around me. Yesterday a small sandpiper was really happy to be alive and put on an amazing show of yoga (what I should be doing) in the sand just beyond wave's reach. There is so much beautiful peace to be found in still quietness. Enjoy the photos. I love good coffee. One of first things I wanted after my aorta replacement surgery was a cup of coffee. But I detest coffee made in the drip maker. The product tastes like what I would suppose plastic and petrochemicals taste like. Blah! Furthermore, there are quite a few articles out there pointing out just how dangerous chemicals that leach from plastic may be, and the harm to our bodies (and cardiovascular system) that hot water carrying those leached compounds from the drip maker can cause. Yuck! Moreover, it is possible that we are poisoning ourselves by using drip coffee makers. There are many petrochemical related compounds, mold release agents, stabilizers and other substances that may be found in plastics. Over time the hot water running through a drip coffee maker with plastic parts may leach out chemicals that should not be in our bodies. For more information on plastics and chemical leaching check out the link here to an good NPR news article. Fortunately we found a coffee press system that is stainless steel and glass. The Mr. Coffee Press makes the best coffee I have had in a long time. A coffee press without plastic is a great way for anyone to live a 'greener' and more sustainable life! And I am not worrying as much now about drinking leached plastic compounds every morning. Less worry means less stress on my bionic heart and this is good news. So for those of you who are unfamiliar with this simple coffee system, here is a quick look at the way I make coffee in the morning now. First heat water in a teapot, preferably filtered water. Second grind your favorite whole beans into whatever grind size you like. I prefer strong bold coffee so my grounds are relatively fine. Then pour your ground coffee into the bottom of your coffee press. Add hot water. I like mine about 160F, but I've found that as long as the water is steaming it should be hot enough. Do not bring your water to a hard boil. Experimenting around with different water temperatures will allow you to choose just how hot you want your brewing coffee to be. Some mornings I just listen for the teapot to start making its grumbling noises and I then know the water is ready. Let the coffee brew for about three minutes. Add the plunger lid and gently press down. You will be totally amazed at how delicious your coffee tastes! Sustainability and health go hand in hand. Removing plastic drip coffee makers from our lives is a good start to better heart and cardiovascular health. I have been meaning to write several posts about connective tissue issues but every time I sit down with my IPad I seem to have forgotten just what I was going to write about. Well, I am going to try and get through this post without forgetting what I actually wanted to tell you. This is really frustrating, a cry for help from me, mostly to myself. It is important for me to find ways to cope with not being able to remember things. For one thing, the dread of 'am I coming down with Alzheimer's Disease' lurks in the not so distant background each time I have an episode of 'I can't remember'. That means I worry about Alzheimer's Disease many times a day and worry is not something I am supposed to be doing. Worry causes stress which in turn contributes to hypertension which in turn is not good at all for my seriously weakened and dissected cardiovascular system or the pseudoaneurysm on my coronary artery. Mostly I deal with my insecurities about the fragility of my heart, arteries, memory, stuttering and connective tissue problems with a blend of persistent but low impact physical therapy and humor. Certainly it is more palatable for me to joke about my short comings than to deal with ugly defensiveness on my part. But today I thought a frank discussion and sharing of experiences coping with forgetfulness would be the best route for me to take. Sharing with others about one's shortcomings opens up vulnerabilities but in a safe atmosphere can become a healing modality too. So I am sharing with you today some of the things I can remember enough of about my forgetfulness issues to record here before they disappear into wherever lost memories go. Ever since I had unexpectedly been subject to two open heart surgeries, one where my heart was on bypass for quite some time, my ascending aorta replaced and a mechanical heart valve installed, I have struggled with short term memory recall. As a blogger I used to have excellent recall of words. My mind was part of a walking thesaurus; me. Not anymore though. Now I keep a tab open to the thesaurus wepage on the computer when writing. So several times over the past few weeks I've had some seemingly great ideas for a cardiovascular or connective tissue or Marfan post only to arrive at the IMac empty minded. Sheeez. That was so frustrating. I have much to say and share but I just cannot remember what it is I want to say much of the time. The other day I was leaving a business and headed to the pharmacy to pick up a refill on some my medications. Exiting the drive I could not figure out which way to turn. Do I turn to the right? Maybe I turn to the left? Arrrrgh! This is happening more and more frequently to me. Then this week on the way to drop my teen daughter off for her college class where she was having an exam, I became wrought with irritation when I could not get out my answer to her question about the topic she was being tested on. I wanted to share three very important study points with her. I had them laid out clearly in my mind but they would not come out of my mouth in the form of words. As soon as I started to tell her the first then the other two would disappear. So I stopped and rethought the three facts through again, and once more, as soon as I began to discuss with my daughter the information disappeared from my mental recall folder. I need to stay active physically to keep good blow flow to my brain. Diet is extremely important. I must do 'brain' foods! Plenty of rest is an important thing to add to my 'to do list'. Daily mental exercises are a must. Support group interaction and participation (sharing) is required. I need to focus and stay away from multi-tasking. One creative solution I've come up with solves the 'which way do I turn?' dilemma. Instead of asking myself 'which way do I turn? ', I first tell myself where I am headed. This peels back the layers of a more complex question, simplifying the decision making process from a 'which way do I turn to go where?' to a statement 'I am going to the ...'. Once I am focused on my destination it is easier to decipher directions. And I tried this method all this week and it works! For me, creative solutions to short term memory issues lie within my ability to adapt! Now, all I have to do is remember these creative solutions from day to day. I have been working with various types of stress relief therapies to lower my blood pressure and reduce hypertension, including diet, cardio, medications and also short poetry. If you notice, this site has a new tab entitled "One Breath Poetry". Enjoy the nature centered haiku and other short poems, all of which are a reflection of my search for peace and health. 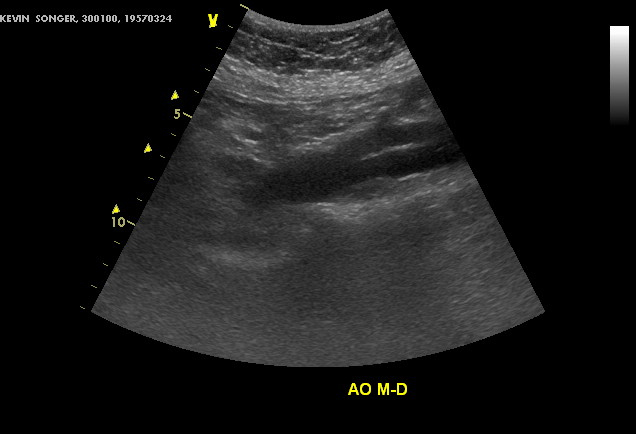 Renal and Aorta Dissection in Marfan Syndrome. Color Doppler Views. 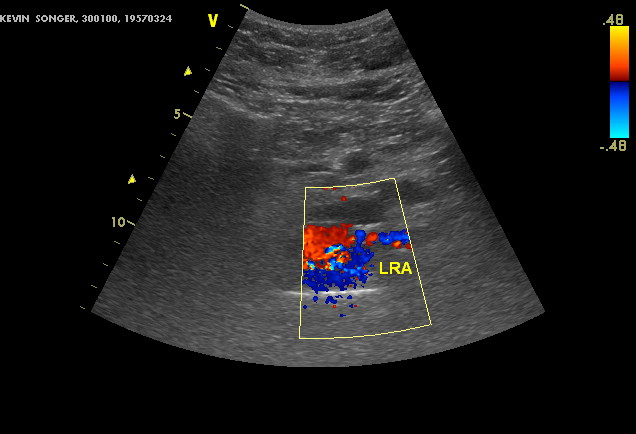 For those of you interested in color doppler photos of a dissected renal artery and aorta, these are my latest, taken a couple weeks ago. Color on a doppler echogram represents the direction of blood flow. 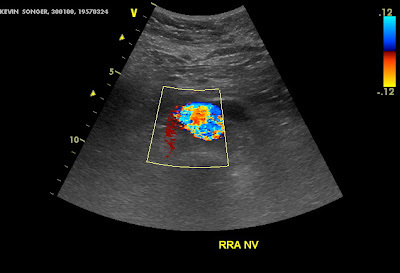 As indicated by the legend bar on the upper right, red and the shades of red represent the velocity of blood moving towards the ultrasound transducer. Oppositely, shades of blue ranging from light to dark reflect the speed of blood flowing away from the doppler unit. In the photo above the blue represents blood flowing through the true aortic lumen ( the open, original aortic channel) while the redish orange colored section represents blood flowing back towards the ultrasound, or blood caught in the false lumen or channel and flowing back towards the doppler after being caught in the dead-end channel. The false lumen is like a dead end street. There is no outlet to the false lumen channel. Blood flows into the false lumen through the tear in the inner most aortic wall layer called the intimal layer. 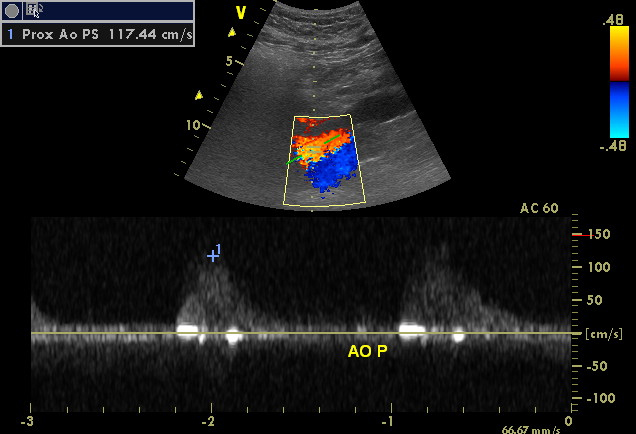 The photo immediately above shows the ultrasound without doppler effects. My aorta's false lumen is visible running directly through the middle of the channel. This 'flap' you see is the section of my aorta torn away from the rest of the vessel. Blood flows through an open channel on one side. The other side of the intimal flap though goes no where. It is a dead end opening where blood flows in, then back out. As long as the true lumen is open enough to provide adequate blood flow and the aorta wall does not aneuryze from loss of strength then the flow of blood to the body may still occur. 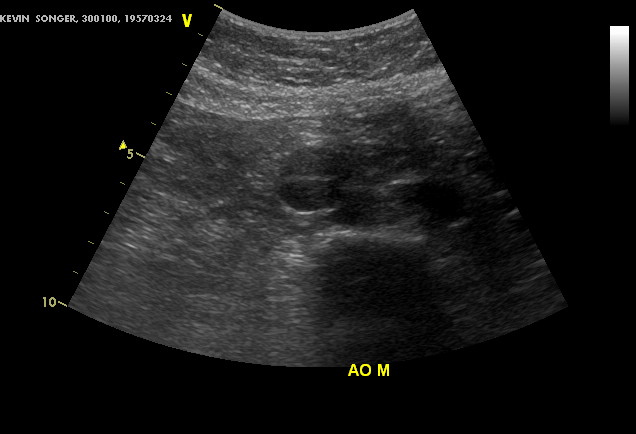 Another side view of the intimal flap inside my aorta. Medications and diet can help control blood pressure and pulse rate. The lower these variables are the more likely the blood flow can be managed. My blood pressure averages 109/59 and I have a pulse rate of around 45 beats per minute. The issue with my massive dissection is the fear of aneurysm or total blockage of blood flow. Because renal artery dissection is one of the health problems I am dealing with, my hypochondria goes into high gear whenever I see blood in my urine. Is my dissected renal artery aneurysing or bursting? In fact, last month while visiting my parents in Tallahassee I started having lots of blood in my urine. My wife, Judy took me to Tallahassee Memorial Emergency Room. I honestly thought I was having an aneurysing renal artery because of the pain's location and the amount of blood. Fortunately the blood was caused by a kidney stone. 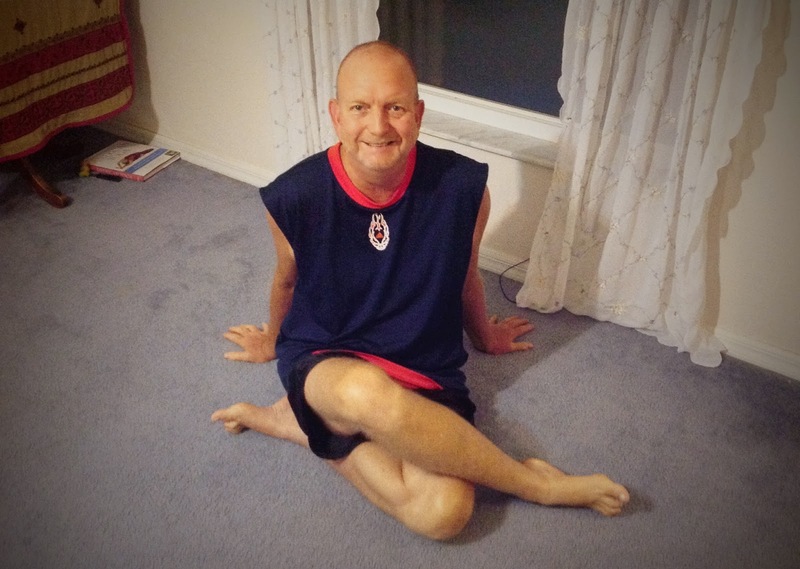 But living with constant fear, knowing one's aorta wall is compromised is a constant physical and mental challenge, one experienced by most of those struggling with Marfan Syndrome and other connective tissue disorder issues. Seems lessons are always learned the hard way for me. It is my own fault though. I had always read about the many benefits of the plant moringa, especially as a food and source of vitamins, minerals and nutrients. In fact, moringa provides solutions to far more issue than just health. The tree can remove pollution from water, grows easily where water is scarce and provides livestock with protein. As a plant biologist, I've always munched on berries, leaves, nuts and fruit from plants in the garden and plants in the wild. And I've never had a problem, until the other day after a week of eating a handful of moringa leaves each day. Immediately after eating the moringa leaves I began feeling full of energy. There is quite a bit of literature available pointing to how the phytochemicals in moringa can actually improve peripheral circulation. But within a couple of days I began to urinate blood, lots of blood. At first I thought I was passing another kidney stone. It'd only been a couple weeks since I passed three very large stones and they did some serious damage on the way down, creating lots of blood flow with their razor sharp edges. But the kidney stone damage cleared up within a couple of days. After a week of urinating blood I began to think the problem at hand was not a kidney stone issue. Then someone sent me a link to a website where the information suggested moringa could cause internal bleeding. So I began to research moringa's effects on bleeding and clotting. There are several quite complicated scientific papers on how moringa's chemical components can interfere with blood clotting. After reading and rereading the medical terms I realized that the plant is actually a very powerful anti-coagulant and even an abortifacient. So the morning habit of eating moringa leaves stopped. And within a day there was no more blood in my urine. The more I read and researched, the more I realized this plant is not a plant to be taken lightly when ingested for any reason. Moringa was causing me to hemorrhage. I was actually bleeding out internally. Now before I would had scoffed if I had read this. I would have said something to the effect of 'it was a fluke interaction with other medications', or 'actually something else and not moringa'. But once you experience first hand the power, good or bad, of this plant, you stand in awe of it. We have several moringa trees planted around the yard. Now everytime I walk by one I shiver just a little. The plant can be a blessing. The plant can also be a monster. Lesson learned the hard way. Herbs, leaves and berries can be good. They can also be deadly.